The most successful design projects often start with a successful business foundation. Whether you work on an agency team with other creatives or are a freelancer trying to sell your own products and services a solid web design proposal can help you win clients and set expectations for work. Here’s everything you need to know about creating a web design proposal that will help you land new clients. We’ll discuss what a web design proposal is, how to write one, and share some helpful templates to get you started fast. What Is A Web Design Proposal? A web design proposal is a document that will help you sell yourself and your work to clients. It’s a summary of what you can do for a client with a breakdown of the problem they are trying to solve and the solution you can provide. A proposal is a common request from companies and individuals looking for website design services. A web design proposal isn’t just a breakdown of costs or estimate of work (although some of that information is included). A proposal is a common request from companies and individuals looking for website design services. Often companies will send out a request for proposals before starting a project. Your answer is in the form of a web design proposal, so you want to make sure yours stands out. Most designers have a default or template website design proposal that serves as a starting point for each new project request. That template then gets customized for each client and their needs. It is just as important to have a well-designed and well-organized proposal as it is to showcase solid portfolio items and references. In many cases, the design proposal is your introduction to a potential client and you want to make a solid first impression. What Should A Web Design Proposal Include? A website design proposal needs to be long enough to help a client understand what you can do, but not so long that they don’t get through the information. Cover page: This simple letter should be addressed to the client and note the project name (important if you are responding to an RFP) and an introduction to your visual style with brand elements. You can also use this space to include a short – one to three paragraph – overview of the proposal. Confidentiality statement: We all know that products and services vary greatly by project. A simple confidentiality statement asks that the information in the proposal not be given out publicly. Problem statement: State the problem the client is trying to solve, such as “Company X needs a website redesign and with the revised copy to reflect search engine optimization best practices. Make sure you have a good understanding of the client’s goals and needs for this section. Recommended solution and services: Now, provide the solution. How can you help the client meet their needs? This is probably the chunkiest part of the web design proposal. Approach and process: Provide a brief outline of how you work and how long the project is expected to take. This is also a good place to include team members that will be working on the project (if applicable). References: Provide examples or case studies of some of your best client work. These examples serve to showcase your portfolio as well as provide references. Fees and pricing: Break down of the costs associated with the project. Also, include a contract that can actually be used to initiate the project. About/company information (optional): Include a section with brief information about your company, any specialization you do or accreditation you have and team member bios, if applicable. How Do I Write a Web Design Proposal? It’s your first opportunity to show that you are the best person for a job. Your web design proposal should be written in a persuasive form. It is a selling document that will help a client decide if they want to work with you. Use a conversational tone that sells the benefit of your product or services for the client. Don’t get caught up in small details. A good overview is enough. Include prominent calls to action, inviting the client to call you with questions or invite you in for a meeting. How Do I Outline Pricing in a Web Design Proposal? The trickiest part of the web design proposal can be pricing. Some clients will actually flip to pricing first before looking at the rest of the proposal. Keep it as simple as possible. Clients don’t need to know the details of every fee or items you might incur on the way to creating their project. Lump elements into easy for clients to understand categories. Too much technical information can be overwhelming to clients and too many line items can lead to questions about what can be cut. 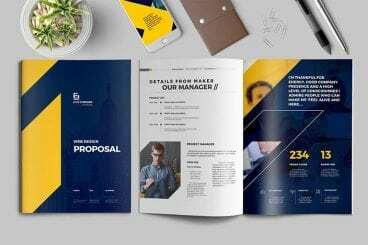 Now that you have an idea of what a web design proposal is and what to include, we have a few web design proposal templates to jumpstart your creative process. Even if you don’t need a web design proposal right now, it is a good idea to create a template using your colors, information, and branding so that you can answer requests quickly and professionally. There’s no reason not to start with a website design proposal template and customize it. A good web design proposal gives a potential client a good idea of how you can help them solve a design challenge. It’s not just a breakdown of costs; it’s a selling document that helps push someone to hire you (or at least get a meeting to talk about the project). A web design proposal template can help you be ready to answer a call for proposals at any time and feel a little less anxiety about making a business case to a potential client about your products and services.